Bartholdi produced a series of drawings in which the proposed statue began as a gigantic female fellah, or Arab peasant, and gradually evolved into a colossal goddess that resembled the ones he had contemplated in the early and mid 1860's. We aren't here today to bow before the representation of a fierce warlike god, filled with wrath and vengeance, but we joyously contemplate instead our own deity keeping watch and ward before the open gates of America and greater than all that have been celebrated in ancient song. Instead of grasping in her hand thunderbolts of terror and of death, she holds aloft the light which illumines the way to man's enfranchisement. We will not forget that Liberty has here made her home, nor shall her chosen altar be neglected. Willing votaries will constantly keep alive its fires and these shall gleam upon the shores of our sister Republic thence, and joined with answering rays a stream of light shall pierce the darkness of ignorance and man's oppression, until Liberty enlightens the world. Grover Cleveland, Dedication speech for the Statue of Liberty (28 October 1886). Since September 11, 2001, I have often thought that perhaps it was fortunate for the world that the attackers targeted the World Trade Center instead of the Statue of Liberty, for if they had destroyed our sacred symbol of democracy I fear we as Americans would have been unable to keep ourselves from indulging in paroxysms of revenge of a sort the world has never seen before. If that had happened, it would have befouled the meaning of the Statue of Liberty beyond any hope of subsequent redemption -- if there were any people left to care. I have learned from my students that this upsetting thought of mine is subject to several unfortunate misconstruals, so let me expand on it to ward them off. The killing of thousands of innocents in the World Trade Center was a heinous crime, much more evil than the destruction of the Statue of Liberty would have been. And, yes, the World Trade Center was a much more appropriate symbol of al Qaeda's wrath than the Statue of Liberty would have been, but for that very reason it didn't mean as much, as a symbol, to us. It was Mammon and Plutocrats and Globalization, not Lady Liberty. Henry van Dyke, Liberty Enlightening the World (1917). Emma Lazarus, "The New Colossus", Emma Lazarus, Selection from Her Poetry and Prose (1944), ed. Morris U. Schappes, p. 40–41. 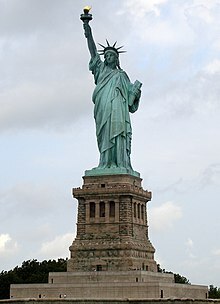 Congress had allocated money to erect Frédéric Bartholdi's Statue of Liberty Enlightening the World, but had provided no money for a pedestal. A citizens committee invited famous authors to write appropriate words and donate their manuscripts for auction. Lazarus wrote this sonnet (1883), which can be found on a plaque in the pedestal of the Statue of Liberty. The last four and a half lines are also engraved on the wall of the reception hall of John F. Kennedy International Airport, New York City. Dan Vogel, Emma Lazarus (1980), p. 157, 159. Taking the form of a veiled peasant woman the statue was to stand 86 feet high, and its pedestal was to rise to a height of 48 feet. George Bernard Shaw, The Future of Political Science in America, p. 7–8 (1933). This address was given at the Metropolitan Opera House, New York City, April 11, 1933, before a special meeting of the Academy of Political Science held in honor of Shaw's first visit to America. The Statue of Liberty means everything. We take it for granted today. We take it for granted. Remember the Statue of Liberty stands for what America is. We as Democrats have to remind ourselves and remind the country the great principles we stand for. This is a place of protection. This is not a country of bullies. We are not an empire. We are the light. We are the Statue of Liberty. Jerry Springer, speech given January 2003, reported in This American Life, Ep. 258, 01/30/04, Leaving the Fold; Act One. The view... from my apartment... was the World Trade Center... And now it's gone. And they attacked it. This symbol of... of American ingenuity and strength... and labor and imagination and commerce and it's gone. But you know what the view is now? The Statue of Liberty. The view from the south of Manhattan is the Statue of Liberty. You can’t beat that. Jon Stewart, Monologue on September 20, 2001. At the beginning of the first episode of The Daily Show to air after September 11th, 2001, Stewart gave a personal monologue about the impact of the attacks on himself and the show. View video of the monologue at The Daily Show's official website (requires Marcromedia Flash). Read a fan's transcript.